ADEN/STOCKHOLM (Reuters) - A team from Yemen's Saudi-backed government arrived in Sweden to attend peace talks starting on Thursday with members of the Iran-aligned Houthi group, in a renewed U.N. push to end a war that has pushed the country to the brink of starvation. A U.N. source said the two sides were unlikely to hold direct talks at a renovated castle outside Stockholm and that special envoy Martin Griffiths and his team would shuttle between them for the consultations, the first since 2016. One representative of the internationally recognised government, Abdullah al-Alimi, tweeted that the talks were "a true opportunity for peace," before the delegation flew out of the Saudi capital Riyadh on Wednesday. Saudi Arabia and the United Arab Emirates - leaders of a Western-backed coalition battling the Houthis to restore President Abd-Rabbu Mansour Hadi's government - want to exit a costly war that has dragged on for nearly four years. Western allies, which provide arms and intelligence to the coalition, have ramped up pressure on them to find a way to end a conflict that killed tens of thousands of people and left more than 8 million facing famine. The Saudi-led alliance intervened in the civil war in 2015 after the Houthi movement ousted Hadi's government from the Yemeni capital Sanaa in 2014. 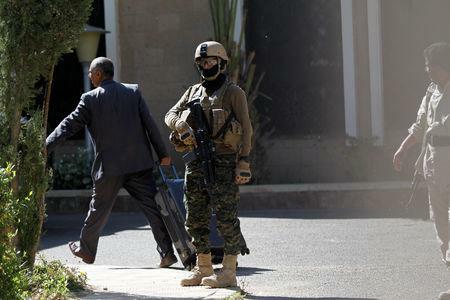 But the conflict has seen military stalemate since the alliance seized the southern port of Aden. The conflict is seen across the region as a proxy war between Sunni Muslim power Riyadh and Shi'ite Tehran. Seeking to reinvigorate peace efforts, U.N. special envoy Martin Griffiths secured some confidence-building measures, including the evacuation of Houthi wounded, to help persuade the movement to attend the talks in Sweden. 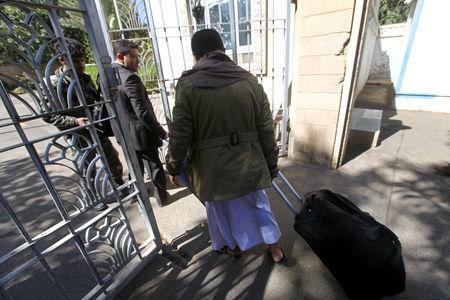 The Houthi delegation arrived there on Tuesday, having failed to turn up for previous talks in Geneva in September. Swedish authorities cordoned off the venue and several emergency vehicles could be seen stationed outside the castle ahead of the talks, which will focus on agreeing other confidence-building steps and the formation of a transitional governing body. "If the consultations proceed positively, we will see an immediate change for people in Yemen. We will see fewer people hit by and fleeing violence, fewer people pushed to the most desperate means of staying alive," said Mohamed Abdi, Yemen country director for the Norwegian Refugee Council. "Equally, if the consultations fail, or stall, so too will hopes of halting Yemen’s steady descent into hell," he said in a statement. The U.N. envoy is seeking agreement on reopening Sanaa airport, swapping prisoners and securing a truce in the Houthi-held port of Hodeidah, now a focus of the war. This could lead to a wider ceasefire that would halt coalition air strikes and Houthi missile attacks on Saudi cities. International outrage over the Oct. 2 murder of Saudi journalist Jamal Khashoggi at the kingdom's Istanbul consulate has refocused attention on the Yemen war and scrutiny over Saudi Arabia's activities in the region. The U.S. Senate is set to consider a resolution to end support for the Saudi-led coalition in Yemen. The United States last month halted refuelling support for coalition warplanes, whose air strikes have been blamed for the deaths of thousands of civilians.